In-Talk Bug Tracking is now fully live. I've made the last few changes necessary, and blogged it here. Bugs should, of course, be entered as bugs. But let's use this topic to discuss (or resurface) general impressions, favorable and not. Hmm, you know, the more I look the more I think the problem is that it only shows the category if there is an ACTIVE bug. I think it should put active bugs in parens, but ALWAYS show the category. It just makes it easier to navigate and find things. But if I wanted to go back and find it and reopen it, it's kind of a pain. Hypothetical - same thing if I wanted to go back and find this bug someone entered in "Other" a few days ago but now there's no active "Other" bugs. So I have to go digging through to find it. But was it Deferred? Closed by member? Closed by Staff? Fixed? Dig through Bug Collectors or All category? I think it doesn't really get you anything to not show the category just because there are no active bugs. It just makes the categories shift around on the page (sometimes it's nice to be able to navigate from memory) and makes it harder to find things. Agreed on all counts. Oh, and thanks again. You didn't even show up on the first page of Bug Collectors posts, but, man, you've been a help. Glad I could help. This site, unlike so many others (*cough*facebook*cough*), just gets better and better every week. It really is quite a feat you and your intrepid crew have pulled off. ETA: I tend to be a squeaky wheel, and that sometimes comes off as being a whining, complaining wheel. Not so. If I didn't love the site, I wouldn't bother. Glad you understand that! If I didn't love the site, I wouldn't bother. Glad you understand that! Is this the place to enter RSI's for bug tracking? I'd like to be able to select from the status and category lists independently. That is, it would be nice to be able to see all open (is that a status?) Add Books bugs, or all the deferred Search bugs. As a further enhancement I'd like to be able to select multiple status' and categories, like all the Reported and Needs Discussion Add Books bugs. The most obvious way to do this would be to add checkboxes in front of each item on the page but there may be more elegant ways to do it. It still only counts open (red) ones, but it lists all categories. Indeed. I think this needs to get extended to RSI in some way. Maybe I'll get my $100 web store after all. Mwahahaha. How about if you could sort the bug category? That is, you click on the bug column and it sorts them by color. This feature is great. Now if I read about a bug that might affect me in Bug Collectors, I can easily tell if it's been fixed! There's now an "All" status. You can use Next/Prev to go through multiple pages, just like the rest of talk. You can sort by Topics, unread/messages, Last message or Last change. These are all very nice changes that I had stopped looking for because they didn't work earlier. Just thought I'd mention it in case people had stopped looking, too. I would like to request that you have a color key on the Bug page. Maybe in the top right ? Now you have to click into something to see what the color means. a) When you click Post new topic on the bug tracking page, have it default to Bug Collectors. Just say if this is complex in the code (since the Post new topic code may be too modularized for this). b) Another cool bit of visual fluff would be to have the bug icons show besides the bug posts in Your posts, Your groups, etc. Not sure where it should go, though. If you put it next to the topic names like in Bug Tracking, it would screw up the topic names aligning. c) Add a Your bugs section under Your World (maybe only if you are a BC member) that will bring up a topic list of bugs you started. e) Change category "Other search" to just "Search". Or is there some reason that I'm missing? There's no regular "Search" category. Okay, I think those encompass a lot of minor suggestions I had. I'd actually rather not see bug icons elsewhere in Talk. I voted No on seeing bug icons other places, but I do like the idea of a "Your Bugs" section under Your World. It would be a convenience. I've added the poll to the other poll thread as well; it will be interesting to see whether the response differs. And I wanted to bump that thread anyway because the response rate for later polls has been very low. 19> Yeah, at some point, I have to admit I reached poll fatigue. But they're so efficient! I hope you'll go back and finish voting eventually. What do we do about bugs that are not assigned? What is the appropriate waiting time before we bump our bugs? Where should all the following be categorized? Yes, since that's where it shows up. The second link is "Profile", which is a completely different tab and usually not considered part of "Home". In the same way, those other things have links off of Home but aren't exactly "Home". I wouldn't normally consider Reviews part of the Home page, for example. You can get to them from a variety of different pages, not just Home. Yeah, those sub-links to Home and Profile should just be removed. I dunno. Too much explication. There's a way of finding everything that's in one status or another. The list would have to re-list all the statuses, and which were blue and which red and etc. etc. 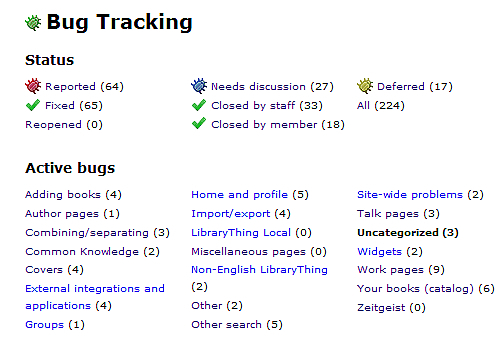 When you click Post new topic on the bug tracking page, have it default to Bug Collectors. Just say if this is complex in the code (since the Post new topic code may be too modularized for this). Meh. I think it's best if it works the same everywhere. Changing defaults would be unexpected. Add a Your bugs section under Your World (maybe only if you are a BC member) that will bring up a topic list of bugs you started. Yeah, but then people will want bugs you posted to, etc. I think the current toolset is adequate. Every new feature takes time away from actually fixing bugs and, unfortunately, also kills another kitten. I have them here, in a cage. They are looking afraid. There's no regular "Search" category. The goal is to move "add books" stuff to that category. I'm so tired of people posting bugs like "I can't find my book. Why doesn't it work?" You never know what they mean. Sorry. You I think you lose on this one. I don't want to take up a full column for it--a column that would usually be empty. And it looks very jumbled when it just pushes the rest over. What is the appropriate waiting time before we bump our bugs? Yeah, barring some other issue. They're persistent subnavigation on the home and profile pages. 27> Yeah, but then people will want bugs you posted to, etc. This is the only I think is worth a kitten. The other ones are mostly visual fluff. I want this one for the same reason I want "Your topics" for topics you start. It actually helps a LOT when you need to go back and find topics/bugs you started, which tend to mean a lot more to you than topic/bugs you posted on. And you can see topics/bugs you posted on using Your posts. There is no way to filter that to topics/bugs you created. Okay, choose between your bugs and your topics. 29> Can't I just donate another kitten? If I had to choose, I'd go with Your topics. Mainly because Your bugs is a subset of Your topics. Will trade Your books for Your topics. Your books is the most horrible thing about reading Talk on the iPod; I'm forever accidentally tapping it when I mean to go to Your groups. I would also trade Your Books for Your Bugs (or Bugs You've Posted To). 27: I would like to request that you have a color key on the Bug page. Put the icons by the appropriate link in the Status section at the top? I've asked for a 'Your topics' (I am assuming this is stuff I started) starting sometime in the first 3 months that I joined. This would be good. I noticed something yet again on the "Categories only shown if _____" topic. You changed it so that categories are shown and clickable even if there are no active bugs in them. Did you mean to make it only show them if there ANY bugs in the category? Right now it still doesn't show them. I think it should, just so categories stay in generally the same spot (unless you add a new category, something that's not really a frequent occurrence) and just to help educate users on all the categories. I can understand if you just don't prefer it that way, but I thought I'd point it out in case the current behavior wasn't intentional. Are you saying there's one with no bugs at all that I'm not showing? I'm down with the idea, but is it clear? What make something "yours"? I suspect people won't know. 39> Yes. I just categorized all the Uncategorized ones. So now Uncategorized isn't there. 40> I think it's pretty clear. Creating a thread implies possession (in the identification sense, not the control sense). We already use this concept every day, e.g. "Zoe's poll thread". ETA: I definitely don't think it's any less clear than "Your groups" or "Your books" or "Your posts". "Your groups" doesn't imply that I am the owner of the groups. "Your books" is usually filled with posts that I've never participated in. "Your posts" has a lot of threads that I've posted to at least once, and the links in no way take me to my posts but actually to the thread. So I'd say the terminology is a little loose in all those cases. It's just one of those things that even if you don't grasp it intuitively, you get it after clicking a few times. Especially if when you've never started a topic, it displayed "There are no topics created by you." Plus, you have the benefit that most other online forums have the concept of "show me threads started by me." I meant for Topics or threads to be interchangeable not use both, one or the other. ETA: I still want "Your topics." I also would prefer "Your favorites". Then we could replace "Ignored" with "Your ignorance". The whole 'world' thing bugs me. Why your World? Why the World? What does the world have to do with my posts on talk? I do spend lots of time here, yes, but it really is not my entire world. I have the laundry, you know. I like "Your Topics", but you could also say "Your Started" if you want to keep the parallel structure and get in the idea of starting the thread. A bit awkward, but I think it could work. >51 Nicole_VanK: That looks too much like a typo, I think. ETA: I don't think everyone's going to agree on ANYTHING as being the "best." But isn't there a consensus is at least "good" for everyone, even if it's not "best" to them? But isn't there a consensus is at least "good" for everyone, even if it's not "best" to them? Yeah, I'm fine with "Your topics". You Started ...... Then obviously you need the Ipad. In terms of a color key: Tim you run a book site, words are your friends. You can summarize. I have listed some examples below. Or you could have the meaning pop up when you mouse over the colored bug. 56> Or you could have the meaning pop up when you mouse over the colored bug. It happened because I happened to be viewing another bug. But it really threw me, as I was entering a bug and it looked like it already had bug info. Perhaps the "Post a new topic" could clear the bug box? 26> Yeah, those sub-links to Home and Profile should just be removed. I just realized something that maybe should have been obvious sooner. The Profile sub-link should probably stay in certain cases, as it's not always YOUR profile. If you click on someone else's profile, then you can click on Recommendations, Gallery, etc. and you need the Profile link to get back to their profile. You don't get a Home link when viewing someone else's profile. However, I'd say the Home sublink is completely redundant. I can't think of any reason that it's needed since there's a Home link right above it at all times. And the Profile sublink should probably be removed on your own Home/Profile page. I would try to justify it by saying "it helps keep it consistent when you're on your profile and someone else's". But that falls apart since if you're on your profile, you see links for "Home | Profile | Recommendations | etc." and on someone else's you see "Profile | Recommendations | etc. ", so it's already inconsistent. 26/59: How about the secondary home link is removed? 60> Sorry, must not have been clear in my rambling. That was what I thought I suggested. Hey hey, we finally got our first Status War! I think it looks pretty good. Non-intrusive and non-explicative. Please do this. I was searching all over to try and figure out what a red bug on my bug meant and couldn't find it. You're making a mockery of my mockup! I think it would be nice to have different symbols for fixed and closed. I was looking at the page trying to see whether there had been any progress on bug fixes lately, but in the end I had to open individual threads to check the statuses. I personally prefer the colourful bugs; it's easier to see what they are at a glance. 73> Must be a person-to-person thing. Personally, I can never remember if blue=needs discussion or yellow=needs discussion, blue=deferred or yellow=deferred, etc. Red isn't so hard, though. ETA: Also, a benefit of having actual different shapes rather than just colors is for the around 4% of the population that have some form of colorblindness. >74 brightcopy: I think there are two different issues: colourblindness notwithstanding, you're concerned about knowing what the icons mean and I'm concerned about just recognizing them on a more basic level. A big blue bug is simpler than a person with hair, skin, and clothing picked out in different colours, that also happens to have a speech bubble. I don't object to something like a speech bubble to designate "needs discussion", but it should be just a speech bubble, not a multi-part icon where some parts are irrelevant. I like my icons simple and, well, iconic. 75> Ah, I was just responding to the "I personally prefer the colourful bugs" part. To me, the colors do nothing because they don't "mean" anything. But in any case, there's also an icon that's just a speech bubble(s). I like the guys better for the closed ones, though. There's not really a lot of difference between the closed ones, and there's no real small icon that I could find that represents "closed" very well. "fixed" should be a squashed bug. "Deferred" should be a bug without any fur on. Nice. How about a bug with his eyes closed and "zzzz..." in a speech bubble. I'll think about this later. I guess you guys have moved me to icons everywhere. But the people creep me out. Fat little ghouls. I'd rather you not think about it too much. If you just changed the closed bugs to a green X to distinguish them from fixed, like you suggested initially, I'd be happy never to hear about the icons again. Ahhh no creepy people icons. They frighten the children and domestic animals. Green X sounds good to me. And if we need to distinguish between member and staff closures, use a green X superimposed on the LT "L" icon for the latter. Full disclosure: I'm not too keen on the magnifying glass for "reopened" because it smacks of "Needs investigation" but meh. 82> Full disclosure: I'm not too keen on the magnifying glass for "reopened" because it smacks of "Needs investigation" but meh. Isn't that usually why it's reopened? That was my thought, at least. I like the idea of the L icon for the "Closed by staff" one quite a bit, though. I just come from the UI school of "try to make the UI something that adjusts to the user, rather than the UI something the user adjusts to." I'm sure I'd eventually learn (as long as I'm not colorblind, which I think is getting short shrift here given that it's one out of 25 people) that blue bug = deferred, yellow bug = needs discussion. But wouldn't it be better to have the icon try to actually convey that meaning? Isn't that what icons are for? >86 brightcopy: No, I think the point of icons is to stand out and be recognizable and convey information efficiently. There's going to be some potential ambiguity involved no matter what--does that magnifying glass represent the initial investigation required (reported), renewed investigation required (reopened), or further investigation by members required (needs discussion)? And if you have to learn the icons anyway, it's better to keep them simple, vibrant, and distinctive. I just come from the UI school of "try to make the UI something that adjusts to the user, rather than the UI something the user adjusts to." The point of the different-colored bugs is that people are a leg-up when it comes to colors. Red means "hot" somehow. Dark blue means "cool." Having "fixed" items be checkmarks seems a decent concession—they're not "bugs" anymore. But I'm not sure that taking different colors of bugs and turning them into different, unrelated icons really improves immediacy of comprehension. But wouldn't it be better to have the icon try to actually convey that meaning? Isn't that what icons are for? I think this is where we disagree. What are the icons supposed to be doing? Perhaps my stance is wrong. I want to know what's hot. I don't really care why. Completist users may want to see at a glance not the general status of a bug but the exact status. If blue is cool then Needs Discussion should not be blue. It's not cool to report a bug and have it closed by someone else without it being fixed or even addressed. That's not cool, it's rude. Augh, why do the dead horses draw me so. First off, I guess I just am a lot more aware of the colorblind thing. I've had it hammered into my head because one of our employees is colorblind. It really is a pretty big usability problem, as we'll show him something where the only distinguishing characteristic is color and it's all just unusable by him. So that's my #1 thought - each thing needs to have a distinct icon because two icons that are just different colors are useless to about 4% of the population (8% of men, 0.5% of women). Now, given that I was trying to find distinct icons, I never said I was trying to give someone something that would allow them to understand LT bugs statuses without ever having read the bug status labels. I didn't expect them to look at an icon and immediately know what it meant. As you said, most users don't automatically do that (and I wouldn't in this case, either). What I wanted was an easy cognitive link between an icon and a label. So they see a text bubble and see the words "needs discussion." That forms a link in their mind much more easily to what the status is than does a blue bug. It doesn't mean that they know what an icon means, it just means that once they've been told what the icon means, it sticks in their memory much more quickly. That's what I'm talking about in my UI approach and, quite honest, I do think I've got it right. Could some of the icons have been better chosen? Sure! kevmalone had a great idea to use the L icon for LT staff. But this is probably a futile subject as you're not ACTUALLY complaining about "unrelated"-ness of icons, but really icon-ness itself. But I can see your point. Basically, this is a bug system for you. Luckily, you're not colorblind, and it's obvious you like the temperature metaphor quite a bit. I can honestly say that I had NO idea that temperature was what you were going for there. Other than red for Reported, I actually thought you just picked the colors randomly. So I'm not really thinking the "leg-up" helped all that much. So, I guess my takeaway is that this is just one of those areas where a system looks a certain way because it is primarily for your use. I'm happy for you to have a way that gives you the maximum productivity. It doesn't mean that they know what an icon means, it just means that once they've been told what the icon means, it sticks in their memory much more quickly. That's what I'm talking about in my UI approach and, quite honest, I do think I've got it right. The thing is, this only helps at one stage of the process. You learn the symbols, and you're done. Choosing clear, distinctive icons helps every single time you look at the page. The bugs stand out much more than the other icons and can be processed more quickly. And I don't know much about colour-blindness, but I thought red/green was by far the most common? To follow up a bit on my message 90, I analyzed the bugs currently listed as needing discussion. There are 5 cases of Staff simply blueing the bug which effectively blows the bug off the radar. There are 8 cases of Staff marking the bug fixed and so it had to be blued by either the reporter or someone else. There are 7 cases of Staff closing the bug and so it had to be blued by someone. There are 2 cases of NONstaff simply blueing the bug, blowing it off. There are 3 cases of NONstaff closing the bug and so someone had to blue it. In any case, when it's blued it is not cool. I left this thread to do something else and just caught the thread title out of the corner of my eye on my Home Page. I could have sworn it said "In-Talk Baby Tracking fully live". In a way I think all sides in this discussion are both right and wrong. I guess aesthetically I agree more with Zoe but for usability I think Brightcopy has a good point. Maybe to a degree the discussion is about icons or not icons since the color codes are more like pseudo icons. It looks better with a bug than with a colored dot, but it is kind of the same thing and all the dots/bugs look alike. So if I interpret this as "should we have icons" I agree with Zoe that "no" since icons are overestimated. But since the discussion seems to be "what is a useful icon" I agree with Brightcopy since honestly, if color is the only difference then what does the word icon really mean. Needs Discussion and Deferred need to remain as bugs because the bug (problem) still exists. Maybe the needs discussion could be a bug with a talk bubble. And Fixed, and two Closed By icons need to be similar as well. In short the most important thing to get out of these icons is whether the bug still exists or not. Red is actually the most unintuitive for me, since red means stop. I thought it meant closed. Blue I get. Talk until you are blue in the face. Since there's no green bug icon -- just red, yellow, and blue -- I think colorblindness in this particular case is not an issue. Better than just thinking that, though, I actually tested it at vischeck.com. This isn't as good as asking an actual colorblind person, of course, but for the red-green colorblind simulation, the bug icons are all still distinguishable. (The red and the yellow aren't quite as obviously different as would be ideal, but they aren't the same, either. Going to a deeper red would help.) Obviously this won't help people with complete colorblindness, but since that's a tiny, tiny fraction of the population I don't think it's a huge consideration -- I'd worry about accessibility for blind people first. I'm not really going to continue this very much, since at this point there's not much left of the horse, but I did want to respond on the colorblindness comments because it's an interesting issue from a UI standpoint. That website is pretty neat, but it doesn't give you the complete picture. I've talked to the guy at work I've mentioned quite a bit. It's not a simple mapping of "well, to colorblind users, this color becomes this color". It's also a matter of context and monitors. Different monitors have different color calibrations, brightness, contrast, gamma, etc. Even to non-colorblind users, colors can appear QUITE different due to this. Just go over to the thread about the previously-green highlight box in Talk to see an example of this. The context matters, as it's easier for my friend to distinguish between some colors when they are right next to each versus by themselves. So, for example, if they were viewing a page showing a bunch of Reported (red) bugs next to a bunch of Needs Discussion (blue) and Deferred (yellow) ones, it would be obvious that there's three different things. But if they just had some Reported bugs next to Needs Discussion ones, it wouldn't be as easy to figure out what exact color they were seeing. Rather than remember which color, they'd have to remember which "brightness" of bug, basically. Not exactly ideal, as imagine if blue bugs meant one thing, but slightly more blue bugs meant another. As I said before, this is all moot as far as LT goes, as it's pretty clear that Tim likes it this way and he's not colorblind (nor are, I'm guessing, anyone on his staff). But I just wanted to throw it out there to pass along some of the interesting things I've noticed in talking with my coworker. It really drove home to me that in general UI design, you need to rely both on shape AND color and not just color. I've found that it's also made my designs easier to learn for non-colorblind people, too. 99: Maybe some of the bugs could be rotated for the different categories. Won't we need to consider those that are directionally-challenged then? 101: Color + direction should help for either group. At this point, I'd rather just not waste any more of Tim's time with it. My initial goal had been to help him save time, and that definitely backfired. Best to cut our losses. I'd still like a simple way to distinguish between fixed and closed, though. I don't really care what. I'd like for people to stop thinking the blue bugs are "cool." "Thank you, thank you. You've been a truly wunnerful audience. We'll be here all week. " Please don't tip the server. I now have an image in my head of drunken farm boys roaming the halls of college buildings, looking for servers to tip, to avenge the cows. While I am not opposed to other icons (say, a bug with a discussion bubble, etc), I do like the bug and color thing, I think we will learn what they mean fine, and like Zoe, I think the biggest issue right now is that 'closed' and 'fixed' need to be differentiated. Check vs. X works fine for me. But no one is fixing bugs. Suggestion - would it be hard to make it where you can't set something to Needs Discussion unless it is already in Closed by member/staff/Fixed? Maybe Deferred, too? I think it doesn't make sense to set to ND when the status is already Reported, which has happened a couple of times. 118> I have never, in the history of LibraryThing, EVER set anyones bug from Reported to Needs Discussion. Yeah, you just close them. Yes, I closed a bug that was a duplicate. That the creator of the bug recognized was a duplicate, and had no problem with me closing it. So really, it's a mystery why you even cared. This is how it's supposed to work. Why do you think Tim gives us the ability to close bugs that aren't ours? You seem to be the only one here who isn't on the same page. Thanks, though, for apologizing for laughing and accusing me of doing something that I don't do. Oh wait, you didn't. Nevermind. Do not try to act as if you have only ever closed one bug. Please. No, I was just referring to the most recent one that got you ranting on it for me closing it. I've closed others, too, just like Tim created the system for me and others to do. Again, this is how the system is supposed to work. You also realize that if anyone disagrees with any bug I've closed, it's trivially easy for them to re-open them, right? And yet, not one I've ever closed has ever been re-opened, has it? Why do you think that might be? I find it rather sad that this vendetta you seem to have against people using the system as Tim designed it is distracting from this suggestion. Yet you've ranted about how much you hate it when people set other people's bugs to ND (which as far as I know has only happened a couple of times). Can you put down the pitchfork and just think for a minute here? No, you cannot reopen a closed bug. You can set it to deferred or you can make it blue but you cannot reopen a closed bug. The suggestion you are making is a fine one. I agree with it. I could have written it myself. I brought it up. I pointed out the problem to start with. Remember? Vendetta is an inflammatory word and you're the one with the horns and hooves anyway. From the beginning of this, I have tried to make people aware that what they are doing is rude. The fact that Tim doesn't know/see/care is irrelevant. I don't care if it is sanctioned rudeness. That doesn't make it any less rude. The problem here is really just that Needs Discussion bugs are getting ignored. If someone posts a bug with insufficient information to recognize what's wrong, then it should be set to Needs Discussion. That's the whole point of the category. But there should be a way to change from Needs Discussion back to Reported. Needs Discussion should be about gathering more information until it's clear what has to be done. It shouldn't be treated as a replica of Deferred. What's this about "making it blue"? It's not Closed or Deferred, so it's still a bug no matter what color it is. Is Tim really ignoring Needs Discussion bugs? Or is it that he went to DisneyWorld last week and wasn't fixing any bugs. >126 jjwilson61: He said that red means "hot" while blue means "cool", so that the red bugs are seen as a much higher priority than blue bugs. 124> Needs Discussion IS an open bug. 128, If a user opens a bug it is Reported. If you Close the bug it is Closed. If the user wants the bug to live, the user can only Blue the bug by setting it to Needs Discussion. Yes, as you say, Needs Discussion is an open bug. However, it is as if it is shelved. It no longer has the Red Hot Bug designation. And why? Because You Closed it, and you really had no call to do so, which is Rude. Tim set up the system so that users could help by closing bugs that are duplicates or aren't actually bugs. It's not being rude to use the system as it was intended. And if not being able to set a bug report back to reported is a problem, you should take it up with Tim, not excoriate another member. I think you're making more of this blue vs. red thing than is warranted. ETA: And is this what Tim was talking about when he mentioned people getting angry over bug reporting? If so, then congratulations Collectorator for turning Tim off from bug fixing. I've just completed an exhaustive survey of all the bugs I've closed. Well, I'm exhausted. Hopefully I didn't miss any. I've closed a total of 12 bugs since the bug system has went into effect. Here they are, grouped by category with a summary of each. 1: 100046 - What can I say - I entered the bug. It stopped happening, so I closed it. Then I re-opened it when it happened again in a slightly different place. Then Tim marked it as Fixed. 2: 100032 - gangleri had been putting in Series in a format other than the supported one. Tim changed something behind the scenes, which broke this hack. After working with him to help explain this and suggestion that he post in RSI to ask for the Series entries to actually support his desired features, I closed the bug. He posted to RSI and posted a note to the bug to let everyone know. He did not reopen the bug. 3: 100059 - theapparatus posted a dupe bug. I closed it with a link to the other bug. He said thanks. 4: 100242 - gangleri posted a dupe bug. I closed it with a link to the other bug. He did not reopen it. 5: 99967 - saltmanz posted a dupe bug. Tim marked it as Deferred. I closed it and put in a link to the other bug, which Tim had also marked Deferred. 6: 100827 - BarkingMatt posted a dupe bug. I closed it with a link to the other bug. They said "sorry" (I'd call that an agreement that it was a dupe). You posted that you didn't like me closing other people's bugs, and that I should let THEM close it. 7: 100100 - gangleri posted a bug which was actually a side-effect of another bug and it's fix. I closed it, with a link to the other bug. Tim marked both bugs Fixed. 8: 100340 - gocubsgo posted a bug about getting an error that their system clock is causing them not to be able to set cookies. We had quite a few messages back and forth where I tried to help her track it down. Then it just started working fine so we had nothing else to go on. They said they'd post later if it happened again and thanked me for my help. I closed it, with a note saying if it did happen again, to just reopen the bug and put more information in it. Two weeks later, they have yet to post anything. 9: 100756 - Witchylady333 had a problem that turned out to be her antivirus preventing her from uploading images. A few of us helped her track it down to that and figure out how to fix it. I closed the bug. 10: 99872 - prussia_cove posted a bug about not being able to delete books. They just didn't understand that you can't "delete" works at LT, and they were also confused about how LT showed them as "owning" a book. Along with others, I helped them understand how the system works. They thanked us multiple times, and said everything looked great. I closed the bug. Then Tim closed the bug. 11: 100217 - fdholt posted a bug that seemed to be a duplicate of another bug. I closed it with a link to the other bug. Tim then marked it as Fixed. Then fdholt changed it to Needs Discussion and Tim realized it really was just a very similar bug but not the same. He then Fixed it. 12: 99855 - guurtjesboekenkast posted a bug about setting dates on a book not working. It turned out they were setting using YYYY-MM instead of YYYY-MM-DD, which is the supported way to do it. There was some discussion with other users and they realized the mistake. I closed the bug because it looked like it was just user error and the user agreed. jjwilson61 reopened it because they felt LT should pop up some kind of error. I don't disagree with this choice, btw. So, of those 12, only 2 have ever been re-opened. Of those, in #11 I mistakenly thought the bug was a duplicate of another. And Tim made the same mistake and marked it as Fixed. So in this case, my closing was moot because Tim marked it as Fixed anyway. So it would have went to Needs Discussion with or without my closing. The other one was #12, which was re-opened by another user because they felt it should have an error message. Really, where is your problem with how I work on bugs? Do you think the above is evidence of some bad approach to bug tracking? 98930 - koffieyahoo opened a bug about the favicon disappearing. You closed the bug because you were seeing the favicon. MikeBriggs posted asking why you had closed the bug. You responded that they can re-open it, if they want. MikeBriggs re-opened it, resulting in Needs Discussion. 100394 - theapparatus posted a bug about subscription renewal periods not being for the full time period. Tim posted that he was assigning it to Abby. You closed the bug with no comment. When asked why, you responded "I just thought I'd try it since it seems so appealing to others. Flat, though. /shrug" In other words, you just closed it to be petty. Tim then changed it back to Reported because they were trying to work on the bug. So I've caused a grand total of two bugs to be turned into a "blue" bug (#11 and #12). And one of those would have been turned into a blue bug anyway since Tim incorrectly set it to Fixed. So really, I've caused ONE bug to be turned into a blue bug. You've caused two. One of which you did simply because you were in a bad mood. I ask you again - please LAY OFF me on this issue. It does nothing to help the site and it's really beginning to bug me. 125, 127, Thank you for letting me know I'm not shouting down a well. >132 Collectorator: I should clarify that I don't condone your approach to the issue overall (as jjwilson says, it isn't brightcopy's fault), but I just felt the need to point out that there was a real concern at the base of it all. I am not doing anything to him! He is one of the three major perpetrators, and the only one who has discussed the issues with me. good grief. >134 Collectorator: I think the problem is with the system (we can't change blue bugs back to red bugs, and Tim puts a priority on red bugs), not with the users. I think when users see that their actions harm/impede the rights of others, they should show restraint. 134> "Three major perpetrators"? Are you one of the other two, considering what I showed above? You have really made a colossal mountain out of this molehill. You and Zoe and lorax have recently posted that there needs to be something done about the blue bugs, reopening bugs, etc. Because I was talking about it before that, and continue to talk about it, I'm making a mountain? I really don't care if you find the mountain bothersome. Stop contributing to it? Just state that yes, messing with other people's bugs is rude and let it go? How about that? It's not as if I am making an assault upon your character, or anyone else's. I am simply trying to bring attention to the fact that although we can all commit these bug shifting operations, it is probably nicer to Not Do It. 138> The mountain/molehill is this idea that you've somehow got that I'm a "major perpetrator" of creating blue bugs, not the blue bug issue itself. And I've shown above it's pretty baseless. I have created the same number of blue bugs as you! No. I mean to say you are a major perpetrator of Altering the Status of Other People's Bugs. Making someone ELSE's Bug Blue is Rude. Closing THEIR Bug is Rude. Making someone ELSE's Bug Blue is Rude. Closing THEIR Bug is Rude. B******t I respectfully disagree. Users helping sort out other people's problems that aren't bugs, and then closing the bug is helpful. Users pointing out that a reported bug is a duplicate and closing it to get it off the already full plates of the developers is helpful. Both of these are things that the bug tracking system intentionally allows and should be encouraged. I don't think there's much I can say here, although I do will everyone would chill a little. I'll try to solve the problem by fixing as many bugs as I can as quickly as I can. The order I do them in is not, however, going to please everyone. 142> I think there's IS more you can say, Tim. You've got to come down on one side or the other on this one. What is it - do you want us to close bugs (thoughtfully and with good reasons) even if they're not our own, or do you want people to "own" the bugs they create and not have anyone else alter them? I know you want to keep the site nice and amicable, but this is a crucial issue that's coming up here. One user has basically told everyone else they're using the site wrong and they should use it the way they prefer. I'd like your clarification, please. I made the feature so that people can close bugs started by others. That was intentional. Like any other feature of this sort, it should be used appropriately and, considering its effects, carefully. It will not always be so--and that's okay. There are self-correcting mechanisms here, like other users and the fact that I review member-closed bugs. 144> Thank you. I hope that puts the issue to rest, even if it doesn't change everyone's mind. I'll keep doing what I'm doing, which is trying to thoughtfully and with good reason close bugs when they need to be. But that's just part of my overall approach. Foremost my goal is to help LT staff save THEIR time on the bug research and spend it where most useful. No, it's not. It's not "their" bug. It's a LT bug that they reported. If it's not really a bug, or if it's a duplicate, or if it just isn't happening any more, closing it is the right thing to do. If any of these issues are debatable, marking it as "Needs discussion" -- which is still an open bug status, is the right thing to do. I'm reposting this because last time it got off on a totally different tangent that wasn't helpful to the actual suggestion. I'm reposting it because this is being done more often (by non-LT staff) and I have to say it's really quite frustrating and disheartening. >148 brightcopy: Doesn't it make sense in a case where the initial report doesn't include enough information to identify/reproduce the bug? I think the issue is really that it should be possible to change a bug from ND back to Reported when further discussion is no longer needed. 149> No, because Tim uses Reported/Needs Discussion as priority levels. Reported is the highest level, which makes sense for bugs he hasn't even tried to fix. Needs Discussion has historically been used when a bug has been closed/fixed and has to be re-opened to indicate that it wasn't as fixed as thought. In such a case, ND makes sense for closed/fixed bugs because he is at least aware of the bug already. >150 brightcopy: Yeah, I know how Tim is using them. And frankly, he's doing it wrong. If the classifications he's created aren't the classifications he actually wants, then he should rethink the whole classification scheme. It's just throwing in an unnecessary middle step. Reported bugs are ALREADY being discussed. Perhaps the problem is just the terminology. If Needs Discussion was renamed to "Reopened", I think it would make it a lot clearer. Right now, the system doesn't stop that, just like it doesn't stop me from going into every bug Tim marked as Closed by Staff and marking it Closed by Member. Or going in and marking all Reported bugs as Closed by member, then marking them Deferred then marking them as Needs Discussion. They're all unhelpful things you can do with the system, but it's lightweight and so he's sided on the "don't worry about putting in controls until it becomes a problem - trust users first." Unfortunately, in this case the trust is being broken on changing Reported to ND and I think it could use some actual code enforcement. >152 brightcopy: I think there's a place for both Needs Discussion and Reopened by Member. In the first case, more information is required before action can be taken. Here's an example. If you want to stick with the current categories, I would still prefer the ability to change Needs Discussion back to Reported. When all the necessary discussion has taken place, then it's time for Tim to either fix the bug or officially defer it. The way he's treating Needs Discussion now, as a random pile of bugs of various statuses that can just get ignored, we'll soon be no better off than we were before bug tracking was implemented. Needs Discussion should be a temporary state, not an ever-growing pile of neglected bugs. 152> But that's how ND is being used because there's no other way to open a closed bug. I think Tim originally added it as a way to say that he needs more discussion about the bug before he can decide how to close it. So I think Zoe is right but there needs to be a way to change it back to reported when there has been enough discussion. And there needs to be a way to change a closed bug back to reported. ETA: To add the message I was responding to since Zoe sneaked another post in there while I was typing. 153> I can see your point of view, but ultimately the bug tracking system is designed to work with how Tim wants to handle the bugs. So far, he's not interested in changing his process flow to work the way you or others want him to. That's why I am trying to just work within the system rather than change it to what I think would be my ideal (believe me, I'd change a lot). 155> But Tim didn't add ND as a way to reopen bugs. ETA: If you really wanted to follow Tim's process flow then closed bugs should just stay closed because he didn't purposely add any way to reopen them. I can never recall ever seeing Tim set a Reported bug to ND. As far as I've seen, he's only ever set Closed/Fixed ones to ND. I could be misremembering, but I'm pretty sure. >155 brightcopy: I don't think Tim is really dead-set on the current system. He's weighed in only very briefly since the various issues started arising, and he said: There are self-correcting mechanisms here, like other users and the fact that I review member-closed bugs. The problem is that members can't correct each other when certain status changes are irreversible. If the change from Reported to Needs Discussion could be undone, then the conflicts would disappear. Would this really ruin his whole bug-fixing approach? I doubt it. >157 brightcopy: I gave an example in 153. 159> Good call. Not sure how I missed that in your post. I'll amend it to say that I don't think it's very common that he does it. I actually downloaded all the bugs to date for my post #131. I need to run them through some analysis to confirm my feeling. But I may be reading too much into the tea leaves on that one. >160 brightcopy: Yeah, I'm not sure how much you can read into the ordering. But I will say that Tim shouldn't have to spend his time requesting clarification of vague bugs. Members can do that, and wouldn't be afraid to, if only the system were working properly. Okay, I've done an analysis on the bugs and the history on them as of Oct 24th (the full set I downloaded at that time). Of the 283 bugs, Tim set 20 of them to Needs Discussion. He's never set any from Fixed/Closed to Needs Discussion. So you were definitely right in that he doesn't seem to be using it as a "reopened" status. What I did find from looking at the bugs was that he mostly used it as "this bug report is incomplete". In a couple, he used it as "I've looked at this and I'm going to come back to it soon." But I think the fact that he's done this on only 7% of the bugs so far strongly suggests he didn't mean ND to be a typical status between Reported and Closed/Fixed. And the thing that's frustrating me that I'm seeing is that bugs are sometimes being marked as ND by members even when the bug report IS complete and before Tim has even seen it. That just makes no sense to me at all. This is the problem. Apparatus needs the frying pan. Everyone else seems to have figured it out. >162 brightcopy: Thanks for that analysis. I do think the Stalking Tim group really needs to be revived. I still think the easiest solution is to let members change bugs from ND back to Reported. It shouldn't be possible for one member's bad decision to throw off the whole process. 164> And if a member decides they don't like bugs ever being set to Needs Discussion, and constantly sets them from ND to Reported? I guess one approach could be "let's wait and see if that happens." But I think there are fairly strong signs it would. >165 brightcopy: CK works pretty well. 166> As I said, I usually assume the best. I would have for this Needs Discussion thing. Turns out not everything works out as well as CK every time. >167 brightcopy: The difference is that CK can always be changed back. 168> True. Though the downside is that it's a loss less noticeable (so many bajillions of bits of CK data out there). Tim> So you've added the ability for us to mark things as Reopened (as well as the original Closed by Member, Needs Discussion, and Deferred). Any guidance on when you want us to mark things as Reopened versus Needs Discussion? My gut instinct would be that only things that are closed/fixed should be marked Reopened (reOPENed, after all). But it's obviously going to be used by people who don't like having their bug marked as Needs Discussion (even by you). So, going to tell us what you have in mind for it, or will you just leave it to chance? Well, it's been about two weeks since I posted that, and I haven't heard anything back. So I just had to kind of wing it and guess what it is you wanted. I went through and Reopened all the bugs that I could tell that weren't REALLY needing discussion yet were set to Needs Discussion. These were bugs where you (Tim) asked questions and then they were answered but you never responded back, or bugs where other members set it from Closed/Fixed to ND to reopen it, or bugs where one member set another members Reported bug to ND. Hope that's what you wanted. There are still 21 bugs marked ND. Some of them should be, others probably shouldn't. I ran out of steam. Well, from what I've seen, there's really no reason that we mortals needs to set bugs to Needs Discussion anymore. We used to have to do that because it was the only way that you could re-open them. I did a pretty exhaustive survey of the existing bug reports a while back and found that Tim set them to Needs Discussion when he was awaiting answers back from users on specific points (like "what browser are you using?" or "are you still having the problem?"). Things that kept him from being able to work on the bug further. I'm not sure it's as helpful for regular users like us to do that, since Tim may look at the bug and know what the problem is right away. And Tim has already said that red bugs (Reported and now Reopened) are looked at him before Needs Discussion bugs. So all that has led me to conclude that it's best to leave it at Reported/Reopened until he has looked at it and commented and sets it otherwise. I've tried to pin him down a bit on this so we didn't have to do so much mind-reading, but so far he hasn't seen it/had a chance to response/doesn't care enough to respond. So what I'm doing isn't in any way based on the "official" answer, unfortunately. 170-172 Some guidance would be helpful. I was just part of a bug report where the bug cleared up for me. It seemed reasonable to turn the bug report to discussion and check if it had cleared up for others. But I didn't know to turn to back to "bug reported" or that turning the discussion on would delay it being looked at. Fortunately brightcopy rescued the bug, but if I'd had something like the combining rules to look at, I could have done it myself. It's not like brightcopy gets paid to make the bug tracking interface work efficiently.